Article about Marie Goldsmith/Isidine/Korn that teases out her influence on Peter Kropotkin's ideas, as well as looking at her scientific career and her anarchism. Maria Isidorovna Goldsmith was born on July 19, 1871 in Russia (1). There is some confusion about both the date and location of her birth. Some assume that she was born in Switzerland, around 1873 probably in Zurich where the family later moved, but this move was years later. Her father Isidor published Znanie, a positivist (2) oriented review. He was exiled to the north for his views, according to the historian Max Nettlau first to Pinega and later to Arkhangsk (3). Nettlau was of the opinion that she was born in one of these places. Her mother, Sofia Ivanova Goldsmith, was a follower of the SR writer Labrov. Like Lavrov she was also interested in the natural sciences, studying at the Faculty of Medicine in Moscow and later receiving her doctorate at the Faculty of Science in Zurich (4). Goldsmith's father died when she was young, and her and her mother's common interests in radical politics and natural sciences was the basis for their lifelong close relationship. (5) In 1888 she and her mother left Russia and eventually settled in Zurich Switzerland. Before we go any further a matter of names should be cleared up. Goldsmith went by more than as many names as I have fingers. The last name is an anglicized version of an original Yiddish 'Goldsmid', 'Goldsmit' or 'Goldsmidt'. All four of these were used by various people at various times by people who either knew her or wrote about her. Her first name is also rendered either 'Maria' or 'Marie' depending on the author. To complicate things further she adopted two noms-de-plumes in her political writing. One was 'Korn' (sometimes rendered 'Corn'). The other was 'Isidine'. In both cases either Maria or Marie have been used. Her scientific publications were printed under the name of 'Marie Goldsmith', but whether this was the preferred label is hard to judge. In this essay I use this name as a matter of convenience. Goldsmith's first political commitment was in imitation of her mother. She became a member of the International Socialist Revolutionary Students (a branch of the Russian SRs in exile)(6) in June of 1892. She was active in these circles as an editor of their pamphlets. Meanwhile the Goldsmiths relocated to Paris in 1890. Once there she frequented other Russian exile circles and eventually became an anarchist. She still, however, maintained contact with the SRs, actually edited their pamphlets despite her political disagreements with them. As late as 1903 she translated and published the 'Historical Letters' of Labrov. As will be seen later in her relations with other anarchists this was a pattern she held to, never letting differences of opinion to lead to estrangement. Goldsmith studied biology at the University of Paris at the Sorbonne. In 1894 she was awarded her undergraduate degree (7), and later her master's.She worked at this institution for many years in association with her fellow biologist Yves Delage. In 1915 she wrote her PhD thesis 'Réactions physiologiques et psychique des poissons' as a graduate student of Delage. It was published by the Institute Géneral Psychologique in the same year. Long before this, however, she had become his indispensible research collaborator, and was the co-author with him of two important books: 'Les Theories de l'Evolution' (1909)(8) and 'Le Parthénogénèse Naturelle et Éxperimentale' (1913). The former book was particularily influential, and was translated into English, German, Spanish, Portuguese and Chinese. It also figured prominantly in the anarchist side of her life as we shall see later. Goldsmith was also an editor of 'L'année biologique' from 1902 to 1924 (10). As an interesting sidenote she and Delage wrote editorials for this journal defending Konstantin Merezhkovski's symbiotic theory of the origin of chloroplasts. The idea was developed independently by the Russian botanist Andrei Famintsyn who first advanced it in 1906 and 1907. They also wrote a lengthy review of Portier's book 'Les symbiotes' in this journal. This idea fell out of favour for many decades, but it later became famous through the work of Lynn Margulis who rediscovered it without prior knowledge of the Russian biologists who had first advanced it. Herein lies an interesting tale of the history of science. Despite her record of publications Goldsmith had to struggle in the last few years of her life to find scientific employment. She worked as a "laboratory preparer" at the École Practique des Hautes Études from 1927 to 1933. She also found employment as a "seminar leader" at the Faculté de Médicine from 1930 to 1933. She laboured under the dual burden of being both female and undoubtedly being known for her radical views despite her use of pseudonoms. This may explain Nettlau's description of her as "very poor". The collection contains six volumes, and despite Miller's 'presumed' familiarity with them he makes an egregious error about Goldsmith's opinions during the First World War, as we we see later. Goldsmith became the leading figure amongst the Russian exiles in Paris (14), and their anarchist group meetings were held in her apartment (15). It was during this period that she adopted the nom-de-plume 'Maria Korn'. Goldsmith also began a prolific output for the libertarian press, writing in Russian, French, English, Italian and Yiddish for publications across Europe and North America. (16) According to Paul Avrich she also made the acquitance of another newcomer, Emma Goldman, when the latter was in Europe in 1895-1896 on a tour to campaign for the release of Alexander Berkman from prison. Goldman met with other Parisian anarchists in Goldsmith's home. The pair also became correspondents and she later defended Goldman's attack on Johann Most (17) in the pages of De Vrije Socialist on April 6, 1900. 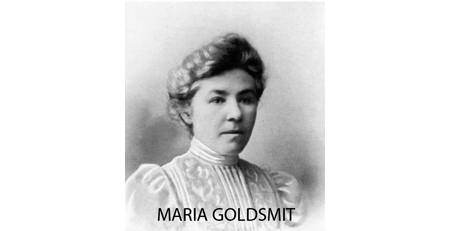 Goldsmith was also prominent in non-Russian anarchist circles, though her main focus was on the Russian movement. At the 1906 London conference of Russian anarchists in exile she authored no less than three of the reports, "on the matter of politics and economics, on organization and on the general strike" (18). In 1914 she was one of the speakers in Paris on the anniversary of the death of Bakunin (19). She also help organize meetings on commemorations of the Paris Commune and the Haymarket martyrs though it is unclear if she spoke at these gatherings. Her major contribution, however, was as one of the founders and one of the main writers of the Russian language journal Khleb i Volia (Bread and Freedom) published in Geneva from August 1903 to November 1905 and smuggled into Russia. Under the influence of the recently successful French CGT she promoted the ideas of anarchosyndicalism in her writings. Her writings on this subject were later produced as a pamphlet 'Revolutionary Syndicalism and Anarchism' in Moscow/Petrograd in 1920. The work has, unfortunately, never been translated from the Russian. Khleb i Volia was perhaps Goldsmith's most significant activity in these years. This journal was initiated in Geneva under the influence of Kropotkin. It grew out of the Russian language Anarkhicheskaia Biblioteca , a publishing house started by an Armenian Alexander Atakekian who had come to London to ask the 'anarchist sage' about how he could best contribute to his ideals. It began by publishing works of Bakunin and Kropotkin, and it later laid plans for a Russian language newspaper. It was actually Goldsmith who first suggested the idea to Kropotkin in their correspondance (20). Kropotkin in turn provided her with an introduction to two other contacts K. Gogeliia-Orgeiani and his wife Lidiia Ikonnikova (21). Along with another anarchist in Geneva, Maksim Raevskii, the Geneva group began publication with Goldsmith, under the pseudonom of Maria Korn, as an external editor in Paris. Kropotkin's problems with the journal began in 1904 when he was disturbed by a lead article, probably the work of Gogeliia, that seemed to present terrorist tactics in a favourable light. He expressed his displeasure in a letter to Goldsmith, going so far as to suggest that the person he had introduced to her might in fact be a police agent. Goldsmith was definitely on Kropotkin's side in this debate, but for reasons quite different from his. They won the dispute. In the next issue of KiV an article appeared denouncing terrorism. As mentioned before Goldsmith, admiring the work of the French CGT, consistently defended an anarchosyndicalist position in her writings for Khleb i Volia. At the time the growth of syndicalism was a constructive reaction amongst anarchists, and French workers in general, reacting against the blind alley of the individualist pseudo-anarchist trend of 'illegalism' that had disgraced anarchism in fin-de-siecle Europe. What syndicalism provided was a practical outlet whereby anarchists could move beyond dramatic demonstrations to productive activity. Kropotkin, however, harboured doubts about the tactic that Goldsmith did not share. The difference was muted, basically a matter of emphasis. Goldsmith was far more optimistic about syndicalism than Kropotkin and even though all the editors of KiV shared reservations about the possible degeneration of syndicates it was Kropotkin who was most emphatic about this danger. (23) This was the first instance where Goldsmith disagreed with the person she undoubtedly considered a mentor, but it was not the last. It was typical of Goldsmith that their differences didn't lead to a break in their friendship. It was also typical of her that there was no direct confrontation. Smuggled into Russia, Khleb i Volia became quite influential amongst workers and young intellectuals. Copies reached as far as the factories in the Urals. Anarchosyndicalists in south Russia where the ideology was most popular appreciated the journal even if they had doubts about how much French ideas were practical in their situation. As mentioned above Goldsmith became Kropotkin's primary correspondant in his years of exile. In the beginning the influence was pretty well one way with Kropotkin playing the role of mentor. From September 1890 to June 1896 the exiled anarchist had published a series of article in the English magazine 'The Nineteenth Century' (24) which were later collated in book form in 1902 under the title of 'Mutual Aid: A Factor of Evolution'. The most popular interpretation of Kropotkin's purpose in wrting the articles was to counter the opinions of Thomas Huxley ("Darwin's Bulldog") who in 1888 published his 'The Struggle for Existence in Human Society' in 'The Nineteenth Century'. Kropotkin mentions this as the motive behind his articles in his introduction to the book's first edition. (25) He also mentions Huxley's 'Ethics' and the opinions of Herbert Spencer whom he also disagreed with. Mutual Aid became an international success and is still considered a classic today. During the composition of his essays Kropotkin wasn't simply writing a political text. To a great extend he was influenced by ideas current amongst Russian naturalists of the time (26) who, unlike people such as Darwin, Wallace and Huxley, carried out their studies in relatively severe climates where intraspecific cooperation was selected for as against competition. Whatever its popularity, amongst both left wing circles and the general biological community, 'Mutual Aid' had an obvious deficiency. It may indeed have established the evolutionary importance of cooperation, later to become the scientific fields of sociobiology and evolutionary psychology, but it lacked a 'mechanism'. That is to say that there seemed to be no obvious way that cooperative habits could give rise to innate cooperative tendencies. Kropotkin had discussed this question before (27) in The Nineteenth Century , but in a rather superficial way. In 1910 he returned to the question in a series of articles in The Nineteenth Century and After, the successor to The Nineteenth Century. In these essays he was concerned both to exorcise the ghost of Malthusism from Darwinism and to present a theory of heredity that would seem consistent with his views on cooperation. He also attempted to recruit the later Darwin to his point of view, especially the Darwin of 'The Descent of Man'. (28) The first essay in the series, 'The Theory of Evolution and Mutual Aid' (1910) (29) was basically an attempt to "recover the real Darwin" who supposedly became progressively more Lamarkian in his latter years. (30) Kropotkin thought that a form of Lamarkism was the most fertile pathway. In his view natural selection was a mere secondary factor and it was acquired characteristics prepared by the action of the environment that set up the basic raw material that evolution worked upon. It was here that Marie Goldsmith and her academic partner Yves Delage enter the picture. There is little doubt that Kropotkin was aware of the problem, perhaps as far back as 1903 (32), and he was aware of the controversies about the nature of heredity as early as the 1890s. He was also a convinced Lamarkian, believing that it would be "a weapon against Malthusianism" (33). There is, however, another thing that is not in doubt ie that he had read Goldsmith and Delage's book before writing his essays. In his third essay, 'The Response of the Animals to Their Environment' their book is mentioned as item # 2 in his notes (34). Finally,there is little doubt that the subject of the mechanisms of evolution had been discussed at length in his correspondence with Goldsmith. It isn't certain that he read the book in its French edition of 1909, though it would be hard to imagine that his good friend Goldsmith wouldn't have forwarded him a copy hot off the press. In the above article Kropotkin references the English edition of 1910, but he was, after all,writing for an English speaking audience. In later essays in the series he referenced Delage and Goldsmith's book in its 1909 French edition. He also references Delage's 1903 book 'L' hérédité et les grands problèmes de la biologie générale` . In 1903 Goldsmith was already associated with Delage, and she had been corresponding with Kropotkin since 1897. It is likely that the ideas presented in Delage's 1903 work had benefitted from Goldsmith's input, and, through her, from Kropotkin's earlier work. This is not unusual in the history of science. Scientific ideas are almost invariably the result of collective effort rather than the lone genius of popular mythology. What I would like to present here is the possibility that Kropotkin's ideas in his essays were more or less derivative from those of Goldsmith and Delage. This is not to say that Kropotkin was a plagarist. He adduced a vast number of studies that the Paris pair hadn't dealt with, and the organization of the material was his own. Yet Kropotkin himself mentions their books, amongst others, as useful reviews, and there no other reviews that shared his views, biological and otherwise, so widely. It is also significant that there is proof that he discussed these questions in his correspondance with Goldsmith (35). What follows depends on two publications. One, 'Evolution and Environment' ,(36) is available in print. It contains both Kropotkin's earlier pamphlet 'Modern Science and Anarchism' and the essays in question under the title of 'Thoughts on Evolution'. The other source is the online English language edition of 'The Theories of Evolution' (37). The latter is interesting in its own right in presenting the controversies in turn-of-the-century evolutionary biology, and it would certainly bear inspection by historians of science (38). In other words Kropotkin saw Lamarkian inheritance as a counterweight to what seemed, in the writings of Huxley and others, to be a reactionary use of terms like Natural Selection to justify the socioeconomic system of class rule and statist imperialism. He saw Lamarkinism as more compatible with his own theories of mutual aid. Lamarkism was to be the means whereby sociability became part of the genetic heritage of animals and humans. He was sorely mistaken in this opinion. Nowadays there is a huge corpus of the study of cooperation/sociability within the fields of sociobiology and evolutionary psychology, all of it based firmly on the premise of natural selection. In the 1910s, however, these theories and facts were decades away in the future. Mendelian genetics had barely been rediscovered. The function of nucleic acids in heredity was unknown. Even the role of the nucleus was a matter of dispute. Goldsmith and Delage were Lamarkians, even though in their book they treated other theories in a fair and balanced manner. The fact that an anarchist, and personal friend, such as Goldsmith could at the same time be an exponent of Lamarkism no doubt suggested to Kropotkin that his "choice of sides" in the dispute over heredity lined up with his political beliefs.There are many parallels between Kropotkin's essays and the themes discussed in 'The Theories of Evolution'. Let's examine a few. This was Kropotkin's argument by which he tied his two assertions together. Yes it was logically flawed as the subsequent history of genetics demonstrates, but given the state of knowledge in his time it was at least consistant. 2)Positivism was a nineteenth century philosophy propounded by the French philosopher and utopian socialist August Comte. It was an early form of empiricism. It also, however, was linked to a proposed technocratic form of collectivism, like that espoused by Henri St.-Simon for whom Comte was once secretary. At the time this philosophy was coloured with a radical tinge. Hence its attraction for the radical intelligentsia, especially as it promised them a directing role in the society that was to replace capitalism. It was an influence on the later doctrine of technocracy. In a mendacious way it later became smuggled into the socialist movement via the Leninist theory of the Party and the role of the intellectuals in it. Today positivism has mutated almost beyond recognition in at least the English speaking world. 5)There is very little information available on Sophie Goldsmith, but there is little doubt that she was a remarkable woman. Her studies in Moscow were carried out under two barriers as she was both a woman and a Jew. At the time Jewish registration in institutions of higher education was still restricted under Tsarist laws. There is no information about her attitude to Marie's conversion to anarchism, but the circumstances of her life suggest that she made few objections. Considering the strength of will that she evidenced in her prior career it is doubtful that Marie could have stood out against any strenuous objections on her part. In the early years Marie adopted the SR ideology from her mother. The two women remained incredibly, almost pathologically, close through Marie's life, and Marie in fact committed suicide because of her mother's death. Before jumping to pseudo-scientific psychologizing, however, we should take note of the time and culture in which the women lived. Such family closeness was not as uncommon then and there as it is today. 8) Les théories de l`évolution B & L Routenberg, Paris 1909. For Yves Delage see Encyclopedia Britannica entry on Yves Delage at http://www.britannica.com/EBchecked/topic/156289/Yves-Delage . To say the least Delage was a 'character'. His main field of research was marine biology, but he contributed greatly to general physiology. He discovered the function of the vestibular semi-circular canals and was a major influence in evolutionary biology and the growing new field of genetics. Still, even though he was a convinced and often militant atheist and an anti-clerical secularist, he spent (wasted ?) time trying to prove that the Shroud of Turin was authentic !! This article is exemplary in discussing both the political and scientific thought of Marie Goldsmith and how they were combined in her revolutionary practice. It is remarkable that although a disciple of the anarcho-communist Kropotkin, she played a major role in promoting anarcho-syndicalist ideas among Russian anarchists. Both she and her mother were noted for helping Russian revolutionary emigrants, but in her later years Marie herself was in need of help, living in extreme poverty, possibly exacerbated by the death of her scientific mentor and colleague Yves Delages in 1920.